The platform is built around 3 main entities: users, things and channels. User represents the real (human) user of the system. It is represented via its e-mail and password, which he uses as platform access credentials in order to obtain an access token. Once logged into the system, user can manage his resources (i.e. things and channels) in CRUD fashion, and define access control policies by connecting them. Thing represents devices (or applications) connected to Mainflux that uses the platform for message exchange with other "things". Channel represents a communication channel. It serves as message topic that can be consumed by all of the things connected to it. 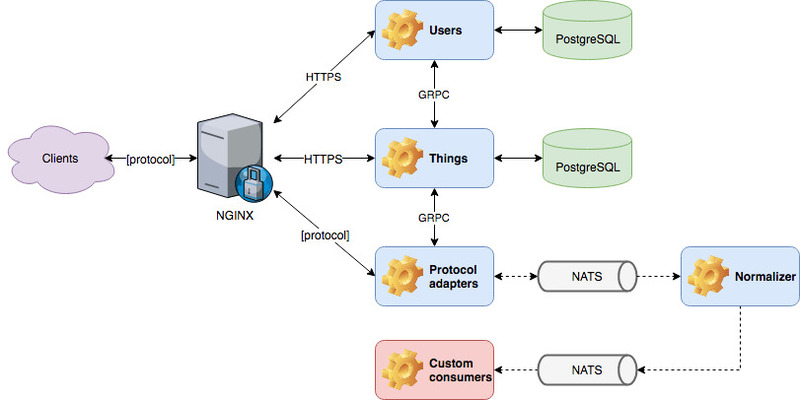 Mainflux uses NATS as its messaging backbone, due to its lightweight and performant nature. You can treat its subjects as physical representation of Mainflux channels, where subject name is constructed using channel unique identifier. In general, there is no constrained put on content that is being exchanged through channels. However, in order to be post-processed and normalized, messages should be formatted using SenML.